Powering the World Forward. This is what Fairbanks Morse is striving to do and what drives our business every day. This innovative spirit was the motivation behind the launch of the new Trident OP, the world’s most fuel efficient engine in its class. We are excited about how this engine represents the future of Fairbanks Morse and we are here to answer your questions. When was the Trident OP introduced? We launched Trident OP in December 2017 at POWER-GEN International in Las Vegas. “It is the way we want to go to market with our customers - with that intimacy. We want to get to know them and create the space to have a discussion, a dialogue about where the industry is going and how we can help the customer succeed,” says our VP of Energy segment, David Santamaria. 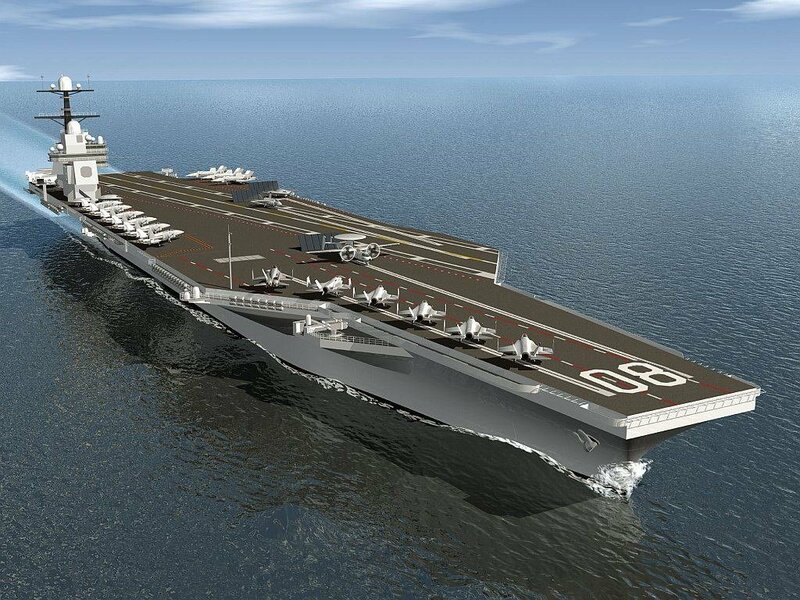 Trident OP has been in development for over four years and Fairbanks has been working diligently to bring it to market. What is the unique value brought to the power generation industry by Trident OP? The value of Trident OP stems from what we found to be the most important features to our customers, which were efficiency and durability. 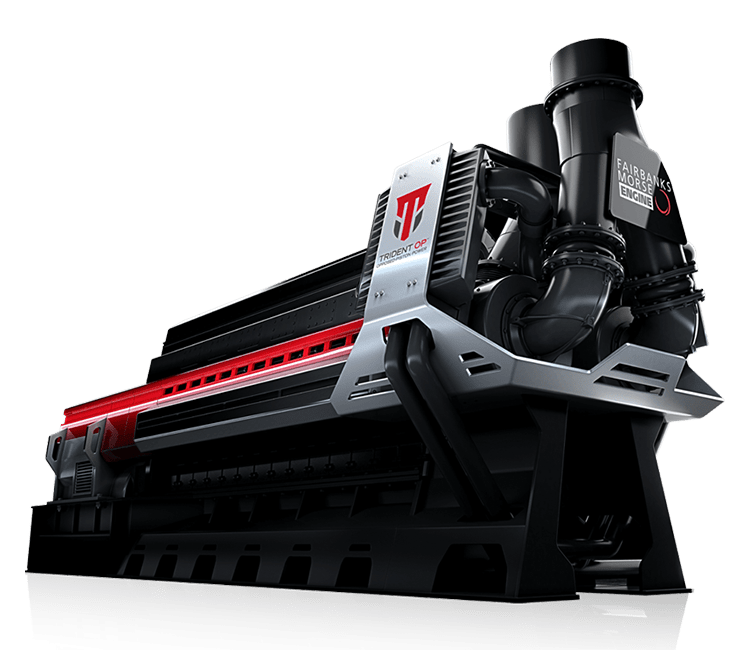 Trident OP is unique in its expected fuel efficiency, recognized especially for off-grid applications. It is unique in its design as well, which is discussed in the following questions. What makes Trident OP fuel efficient? Trident OP is distinguished by its fuel efficiency, as it has improved fuel consumption by over 25%. This was made by possible by its new and improved combustion system and high pressure common rail fuel injection system. How is Trident different from other OP engines? Trident OP has pushed opposed piston technology into the 21st century with its unique engine architecture. Its combustion system is strategically positioned in the center of the engine, where the two pistons come together, eliminating the need for a cylinder head. “It’s much different than what most people are accustomed to seeing in the more traditional 4-cycle engine,” Jim Connell, Vice President, R&D, explains. 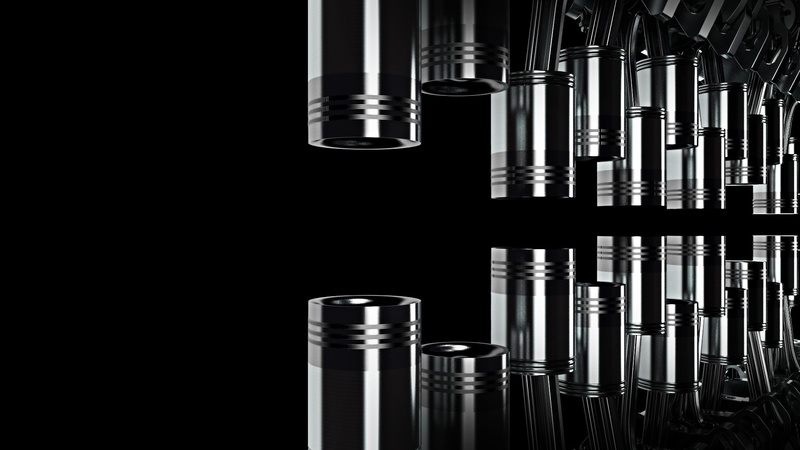 What’s exciting about the opposed piston architecture is that when compared to a conventional engine the opposed piston architecture allows us to produce an engine that has 50% fuel efficiency. How does Trident OP work? Power is transmitted through connecting rods that go in both directions. It is transferred through a connecting rod from the top piston upward to the top crankshaft. Power is also transmitted from the bottom piston to the lower crankshaft. “How does it function? How does it get air in? How does it get exhaust out? The cylinder head is essentially the liner. The liner is the tube that the two pistons run in. You have the intake ports at the top and the exhaust ports at the bottom where the exhaust comes out,” explains Jim Connell. Will a gas version be available in the future? In the future, a gas engine version for the Trident OP will be developed. What applications can Trident OP be used for? The unique design of the Trident OP allows for customization to optimize operation for a variety of environments. More specifically, this engine is well-suited for continuous, CHP, microgrid, and peaking power industrial applications. The Trident OP is easily adapted to meet each environment’s specific needs and priorities. When we first started developing Trident OP, we thought that the best applications for that engine would be on-site industrial power, schools, universities, municipalities, as well as prime power in remote or extreme conditions. What we started to find is that this engine really had a number of additional applications. The Trident OP is flexible by design, utilizing smart controls and a high efficiency turbocharger, so we’re able to integrate this engine into any customizable solution. How does Trident OP stand out among other engines in the industry? Among other engines in the industry, Trident OP stands out because of its simple design. It is noted to have 30% fewer parts, which makes for increased reliability and ease of maintenance. The industry competition is mostly made up of 4-stroke engines with cylinder heads, valve trains, camshafts, and drive systems. The Trident OP has eliminated those complex components. What drove the decision to create Trident OP? “If you look at where we are today, we’ve really embraced our history in that way. To go back to a time where innovation was the lifeblood of the company. We are trying to effectively lean into the future with a product and technology that allows us to embrace the history of the company, but really reignite what is special about FM. With Trident OP, we have effectively reinvented everything about the opposed piston architecture to bring it to the forefront in the market. We looked at just about everything to take the product into the 21st century,” says Marvin Riley, EnPro COO. Didn’t find the answer to your question here? Interested in learning more about the Trident OP? Check out these resources. We want to offer the content you are looking for. Please share your thoughts and suggestions in regards to this new initiative here (link to form). To read more blog posts by Fairbanks Morse, click here (link to blog homepage).